I hope this letter finds you well and that your business is booming. Before I purchased a RainSaucer from you I was in a bit of a water dilemma, and I just wanted to let you know how much of a blessing it has been for me (and my plants) since I received it. The area where I live in Iowa is not close enough to have access to a municipal watersource. The underground rock formations in the area cause the well water to be very hard, and if it were any harder the well pump would probably be sending rocks up the pipe. The water softener I have makes it a little more tolerable, but the salt it uses adds to the cost of operating it. 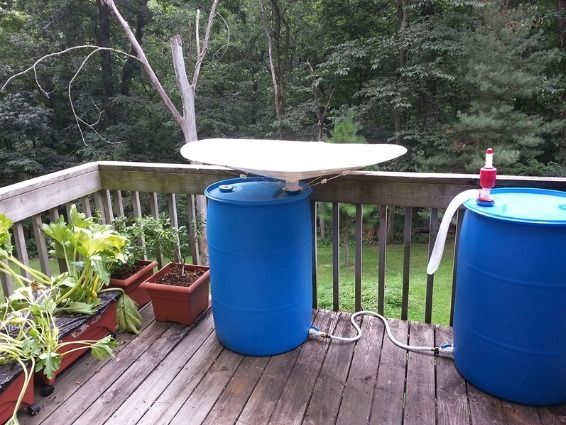 The reverse osmosis system I have produces enough water for drinking or watering plants, but not for both. Some of the plants I have are carnivorous (Venus fly traps, pitcher plants, and sundews) or tropical (bananas, pineapples, and cocoa trees) and they don't appreciate hard or salty water. With the way my luck is the carnivorous plants would probably turn into a scene from Little Shop of Horrors and revolt against me if I didn't share the water with them, and when we were not able reach an amicable water sharing agreement I knew I had to find another solution. I could have captured runoff from the roof with a downspout diverter but I was concerned about the water quality. A first flush was not removing all of the debris and adding a filter to it would only add to the costing the long run. I also could have made changes to the water softening system or expanded the reverse osmosis system, but both would be more expensive than a filter for the diverter. These would all work but they all seemed like over-engineering a solution to a basic problem: the need to have clean water. looking for that would not bankrupt me in the process. Installing it only took a few minutes, it has held up in numerous storms, and I don't have to worry about the quality of water it's collecting. I have about 110 gallons of clean rainwater stored for watering the vegetable garden and other plants, and the abundance of water seems to have placated the carnivorous ones. rainwater that resolved my dilemma. I hope other people will give your product a try and see how it can help them with theirs!